Or rather be caught dead than doing. Character development is a complicated aspect of writing. Like in our own lives, a glaring inconsistency draws a ton of attention, especially on paper (or e-ink). This post was long overdue, and a minor criticism at my last writers group meeting motivated me to tackle the subject. What was the criticism? My protagonist, male…a former deep-cover operative, pulled a bottle of Riesling out of the refrigerator to share with his wife. Apparently, men don’t drink Riesling. Not even in 2005. And I thought it would go nicely with the Thai food they were eating. I was a little defensive, maybe a little hurt…I like Riesling (not a first or second choice, but it does pair well with spicy food). Alas, everyone agreed that a beer was more appropriate. This is a character compromise I am more than happy to make…if only this was their only suggestion about my new story, Black Flagged. PREVIEW. This is a pretty minor criticism compared to some of the critique I have received over the months regarding the protagonist of my first book, The Jakarta Pandemic. Alex Fletcher, decorated war veteran, and former Marine Corps officer, grates on some peoples’ nerves! Who has the most trouble with this character? Conservatives. Alex takes a few jabs at Fox news, here and there. And, he’s a vegetarian that has installed solar panels on his roof. He also keeps his guns responsibly locked in a safe (until there is a definable danger), and doesn’t immediately kill any potential hazard to his family with extreme prejudice. I have also been accused, in a few of the reviews, of pushing a liberal agenda through this character. Huh? Did I mention that Alex is pro-choice and supports gay marriage? No, I didn’t…so I though I was safe from the appearance of political partisanship in the book. Apparently not. Probably a little naive on my part. One reviewer, who loved the story overall, said that the “author was conflicted,” because I created a character that didn’t comfortably fit into ANY political classification. I’m actually proud of that. Still, all of this raised some awareness about character actions, and I do keep this in mind while writing my next book. I have dozens of characters, all with their own thoughts and rationales for what they do. Once again, I miss the good old days of The Jakarta Pandemic. It’s pretty difficult to keep a character “in line” throughout a 300-400 page book, so this will be one of the primary focuses that I assign to all of my pre-readers (those that will read the first edition before it goes to print), writers group and EDITOR (that’s you Felicia). Keep my male characters away from ANY drinks that come with a pink umbrella! Thanks for the peek at this post, Steve. Very interesting to see how the Pine Cone Writers’ Den’s comments dovetail with this blog and your daily sessions in front of the screen. My best blog posts follow our meetings, because the commentary and critique is memorable, and helpful. If not funny, too. Okay, I’m feeling guilty for hurting your feelings. 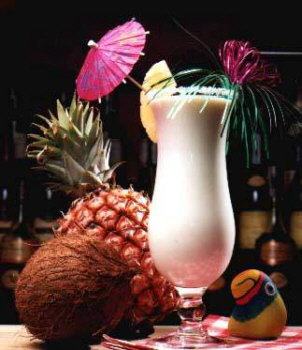 Maybe true men do indeed drink pina coladas. Heck, there is a song about it. Yet, I still think it’s about picking details carefully. If he drinks sweet white wine through out, it may just be an interesting oddity. Only on vacation, where nobody can see me…and I toss the umbrella immediately. I’ll just have to be more cautious ordering wine around Portland. I hope they serve manly drinks at Novare Res next week…I need to atone. Although not truly a comma splice, the sentence is not my best. The only thing keeping it from invoking my freshman year English teacher’s wrath, would be the “and” I weakly added to the sentence. It might be a form of splice even more egregious than the comma splice. I’m glad someone is paying attention. Now that would truly push my conservative reader base over the edge. I’ve already been accused of pushing a Liberal Agenda with my first book. At least they weren’t drinking wine coolers. The problem is not with the reisling in my opinion. I think it’s more that the hero “pairs” his wine, be it reisling, merlot or Boone’s Farm. Heros drink whatever the hell they want or whatever is at hand. They don’t make decisions based on the merits of their food and wine and how the flavors blend. They make decisions about what color fly would lure a bass to strike, or whether to shoot someone with a .38 OR .39 (whatever it takes). Foodies and critics pair wine, heros just enjoy the flavors and move on to something else worthy of their decision making capabilities. By the way, is your pinkie finger extended when you throw back a hearty sip? Only if he intended to use that finger to gouge out the eyes of a villain who has lowered his/her guard based on the hero’s choice of beverage. I would argue that caliber choice is a form of pairing. .45 for someone of imposing stature like you…or a .22 for a squirrel. I recall that you and some friends brought along an elephant gun for Alaska. Paired well for Grizzly…or whatever kind of bear. And I thought this topic might die out,. .38 or .39 is from Mr Mom. Jack was the ultimate hero you couldn’t put in a box. I don’t remember the elephant gun on that bear hunting trip. I don’t remember a whole lot after 3 cases of Rainer beer, a handle of Jack and a handle of Beam. The bears were safe, alas the same could not be said for the morons holding the weapons. Drinking and hunting is a fast way to get on the Darwin list. Proud to say no reisling was consumed though. Ha, I couldn’t place the .38 or .39 comment. Been bothering me for a few days. I knew it was in the same category as Clark Griswold’s “Are you kidding me, this is a Magnum PI.” Very nicely done. I can always count on you to pull up a classic. I liked the fact that the guy in Jakarta Pandemic was a vegetarian and that he was prepared enough to have a solar panel. As for your new character knowing enough to put a wine with a certain food, why not? No one ever thought that Parker’s hero was a wuss for knowing how to cook – ok, he drank a lot of beer. It’s nice to have a heroic type that isn’t a stereotype. And I really liked the shot at Fox. Too many of the action books out there seem to be written as if everyone is a two dimensional ultra conservative. This is a vote in favor of a character with a little bit of inconsistent preferences and behaviors – I think those are called human beings. The over the edge drink would probably be Soy Chai Lattes. Finally, one defender. Thank you, Bernie. I was starting to develop a complex…actually, I already had one. As for Alex Fletcher, in The Jakarta Pandemic, I did get some flack for not writing him as a completely ultra conservative stereotype. More for the sparing use of FOX news digs than anything else. Some of the Marines out there weren’t happy with the fact that he didn’t blast away at everything that threatened his family…no questions asked. Somehow, being a Marine equates with ruthless application of firepower. While most of us would feel that way about protecting our families, Alex’s extensive combat experience applying strict rules of engagement (especially as an officer) would make him the first person to put the brakes on a “middle of the street” killing…until the circumstances gave him no other option. The actions I gave him were conflicted, but “in line” with his experience as a combat veteran and responsible Marine officer. Some may not agree. Maybe because I know people like Alex, nothing about him bothered me. Not even the FOX news jabs. Then again, though I am a registered Democrat and have always voted such, my husband says that some of my views identify me as a closet Republican. As far as the riesling….I don’t see a problem with that either. It’s a German wine, known for its origins and has a distinctive taste. What’s the big effing deal for a man to drink wine, whether he is a killer or not? To me, you would be doing MORE damage by always having him drink beer like he was a redneck or something, yee haw. A cultured, well traveled man would indeed partake of the grape without fear of being ridiculed. And riesling does, indeed, pair well with Thai. Respect! A Martini might be more appropriate for this character, given his espionage persona, but then readers would accuse me of copying James Bond…and my friends would say I wrote the character to mimic myself. I have been known to indulge in a martini here and there. I indulge in martinis here and there too…here in the jewelry studio, there in the living room, there in the kitchen, there in the backyard, here in the bathroom…. I was really hoping you would stop with backyard.